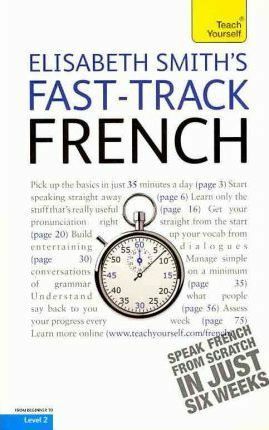 Teach Yourself Fast-Track French 4 Rev Ed Pb. Follow this course for 35 minutes a day and in six weeks you'll be speaking French! Elisabeth Smith has used her wide teaching experience to write a course that covers just the vocabulary and the grammar that you really need. This day-by-day programme is easy to follow and fun to do. At the end of six weeks, you'll have the confidence and knowledge to tackle all the situations you need to know about, such as shopping, eating out and getting around. With just the essential words and phrases to learn, and flashcards at the back of the book to help learn them, progress is fast and enjoyable. By the end of this course, you will be at Level A2 of the Common European Framework for Languages: Can understand sentences and frequently used expressions. Can communicate in simple and routine tasks.